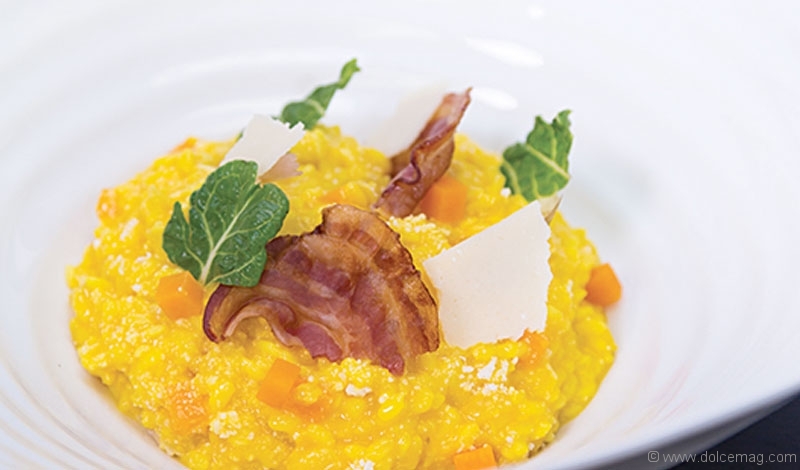 A delicious risotto made in the comfort of your home in only 30 minutes? Yes, please! Pusateri’s Fine Foods delivers exactly that with this dish — perfect for cosying up to while making lasting memories with your loved ones. 1. Clean and cut small squash into 1-cm cubes. 2. Remove and steam Swiss chard stems. Squeeze out water, then chop. Chiffonade Swiss chard leaves. 3. Add saffron to 8½ cups of boiling chicken broth and strain. 4. Keep 4-8 additional cups of boiling, salted water on hand. 1. Have all ingredients processed and ready. 3. In sauté pan, add olive oil, onions, squash and pancetta. Sauté for 1-2 minutes. Add garlic; cook 15 seconds. 4. Add rice to squash and pancetta mixture and stir for an additional 25-35 seconds on medium heat. 5. Add wine to the rice and deglaze. Add boiling saffron chicken broth up to rice level only and stir. 6. Cook out rice on medium heat while stirring continuously and adding in stock 1-2 ladles at a time. 7. Once chicken broth is used up, start adding salted water (if needed). 8. At the 10-minute mark, add Swiss chard and cook for another 3-5 minutes. 9. At the 13-15-minute mark, cook off excess stock, then turn off burner. 10. At this point the risotto is ready. Turn off heat and fold in cheese and butter. Season and serve.